Woodland, Home of Sam Houston, Huntsville, Texas. 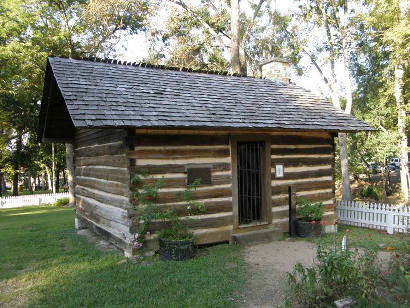 "Squared logs covered with hand-hewn, whitewashed boards"
General of the army which won the war for Texas Independence, 1836, and first President of the Republic, 1836-1838, Sam Houston was one of the most controversial and colorful figures in Texas history. In his eventful career, Houston had resided in Nacogdoches, Liberty, Houston, and Austin. He and his wife Margaret (Lea) built this house, "Woodland", in 1847 to provide themselves with a town place. With enthusiasm, he wrote to a friend that the new home was a "bang up place!" and that the climate was "said to be healthy". Houston and his wife lived at Woodland while he was a U.S. Senator, 1846-1859, perhaps the happiest and most prosperous years of his life. Four of their eight children were born here. 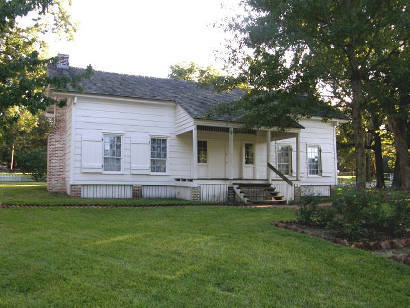 The house was built in a style common to the South at the time: squared logs covered with hand-hewn, whitewashed boards. The detached kitchen and law office were built of unfinished, squared logs. 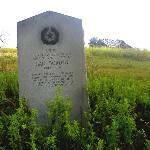 In 1859 Houston was elected governor but, although opposed to secession, he could not keep Texas from joining the Confederacy in 1861. Deposed from office, he returned to his second Huntsville home, called the "Steamboat House", where he died in 1863. Law office - "built of unfinished, squared logs."